"Firefall." A team of law-enforcement officials shows Archie Stryker a video of Rom's rampages on earth. Angry at the deaths of what he thinks are humans, Stryker agrees to work with the officials to take the fight to Rom, not knowing that they are all Dire Wraiths in disguise. Meanwhile, Rom detects major Wraith activity and goes to confront it. As Brandy Clark comes home to find more police in her apartment and is taken away by them, and as Stryker undergoes physical training, Rom attacks an underground Wraith stronghold. She banishes most of the Wraiths to limbo, only to be attacked by a new weapon -- Archie Stryker, now grafted into the armor of the former Spaceknight Karas, aka. Firefall. Story - 4/5: Bill Mantlo turns in another wonderful story in this third issue of the Rom series. It is surprising how many of the ongoing elements of the Rom saga have already been introduced, and are already being given a great deal of play. The Firefall armor, now in possession of the Wraiths, will be used repeatedly to plague Rom's days on earth, and this issue is where that all begins. Additionally, we are introduced to a number of ongoing Wraith characters, such as Agent Kraller, who has infiltrated SHIELD. There is an unbelievable amount of setup in this issue, some elements of which will not be paid off for months to come. And yet, we are never left wondering what is going on -- Mantlo accomplishes the long-term setup without resorting to the cheap modern tactic of confusing the hell out of the reader for months at a time. You are never confused in this story. A great deal of this story focuses on the thief Archie Stryker. Last issue, he witnessed two attacks by Rom, and believed that the beings turned to ash were humans being killed. Of course, they were all Dire Wraiths, and the ash left behind is a by-product of Rom dispatching them to Limbo. But no one on earth other than Brandy Clark knows this fact yet, and so Stryker thinks Rom is a brutal murderer. He desperately wants to do something to protect humanity from this robot, and so when the Wraiths offer him a chance to get into the Firefall armor, he takes it. Two other supporting characters have important scenes in this issue. Brandy Clark spends her "air time" pondering what Rom is really up to, and trying to decide if she believes him or not about the Dire Wraiths. However, when she gets home to her apartment, the place has been "tossed," and there are two people claiming to be police officers waiting to take her away. Knowing this series as I do, even though I have never read issue four before (next week will be the first time), I strongly suspect that these men are Wraiths in disguise, and that Rom will have to rescue her from them next issue. Similarly, Steve Jackson gets some screen time, and he spends most of it trying to find Brandy, who is his girlfriend. As all these things are going on, Rom has detected a hive of Wraith activity. The Wraiths are underground in a cave, building a giant interdimensional portal, which they plan to use to bring the Wraiths in Limbo back. Rom destroys the portal and then turns his neutralizer on the Wraiths. After a high-octane battle, Rom leaves only piles of ash behind in place of the wraiths. Then he is attacked by the living flame of Galador, being wielded by none other than Archie Stryker, who is now grafted to the Firefalll armor. This issue is packed with great stuff from beginning to end. The Wraiths seem to be just about everywhere, and to have their tentacles wrapped around every facet of our society from SHIELD to local police. Brandy is already conflicted about Rom, and Steve already starting to show signs of jealousy. And with Stryker wearing the Firefall armor, the stage is set for one hell of a showdown. Overall, this is another outstanding story. All the classic elements of the Rom series are present, and each one plays a key role in the story's progress. Mantlo once again shows he is the master of narration as well as dialogue. Artwork - 4/5: Buscema's art continues to be strong in this issue. He has a lot of small panels here, but he packs detail into each one, and he does a great job on backgrounds as well as facial expressions. His action scenes are kinetic as always. The special effects of the Analyzer and Neutralizer are excellent. Cover - 4/5: This third cover is the best so far in the series. 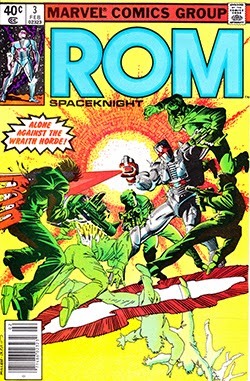 It shows Rom battling about five different Wraiths, and nicely portrays one of them, upon being hit with the neutralizer, fading away into Limbo. Rom looks great and is in a strong kinetic pose. Overall - 4/5: This is another solid issue for the stellar creative team of Bill Mantlo and Sal Buscema. In everything from the pacing of the story to the layouts to the artwork to the dialogue, Mantlo and Buscema know how to do a great comic. As with my earlier reviews, compared to other comics in quality, this story is a 5/5. I only rate it at a 4 because I know there are even better Roms coming and I want to leave room at the top to give them the perfect score.